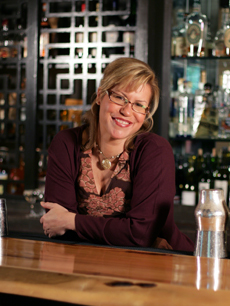 Pegu Club owner and cocktail maven Audrey Saunders will mix sensory-heightening cocktails during "The Alchemy of Taste & Smell" at Astor Center this weekend. Master chefs and mixologists are flocking to Astor Center this weekend to explore all things olfactory and tongue-tingling for a two-day conference, The Alchemy of Taste and Smell. The event kicks off at 6 p.m. on Friday, Nov. 12, with a session on the use of aroma in cocktails (tickets are $55) led by Pegu Club owner Audrey Saunders and Dave Arnold, Director of Culinary Technology for the French Culinary Institute. At 7:30 p.m. Friday, Astor Center flings open the doors for an Opening Night Party (tickets are $75), featuring creative cocktails by Dave and Audrey, as well as hor d’oeuvres by chefs David Chang, Alexander Talbot, Nils Noren and Bill Corbett. Interactive stations will also include dishes by chef Daniel Patterson (Coi, San Francisco) and essential oils presented by perfumer Mandy Aftel. See the Astor Center website for the full calendar of events, which includes sessions led by Wylie Dufresne, Harold McGee and Johnny Iuzzini and culminates with a multiple-course all-star dinner the night of Saturday, Nov. 13 (tickets are $300). On Wednesday, Nov. 17, Allen Katz of Slow Food NYC is leading a workshop on “Greenmarket Mixology for Holiday Cocktails.” Learn how to incorporate farm-fresh ingredients such as herbs and maple syrup into your drinks. The session is from 6 to 8 p.m. at Union Square Wine & Spirits (tickets are $45). And if you haven’t purchased your ticket yet for the third annual Repeal Day Ball on Saturday, Dec. 4, in Washington, D.C., you’d better get on that before the big event sells out. This year, the black tie soiree will be held at the Maison Biltmore in Adams Morgan and will feature themed rooms representing significant eras in cocktail history: 1800s (punches), 1900s (pre-Prohibition), 1920s (Prohibition), 1940s (tiki), 1960s (Mad Men), 1980s (inspired by Cocktail) and “The Future,” along with a main ball room where jazz band The Red Hot Rhythm Chiefs will play. Tickets are $100 (or $150 for VIP hors d’oeurves and afterparty), with proceeds going to the D.C. Craft Bartenders Guild and the Museum of the American Cocktail. At the ball, enjoy cocktail creations from D.C. favorites like Gina Chersevani, Derek Brown, Tom Brown, Chantal Tseng, Owen Thomson, Dan Searing, and Adam Bernbach, to name a few, along with special guests–bartending legends Dale DeGroff from New York, Chris McMillian from New Orleans, John Hogan from Annapolis, and Jeffrey Morgenthaler from Portland, as well as nationally-renowned cocktail historian and writer David Wondrich and Tiki expert Jeff “Beachbum” Berry. 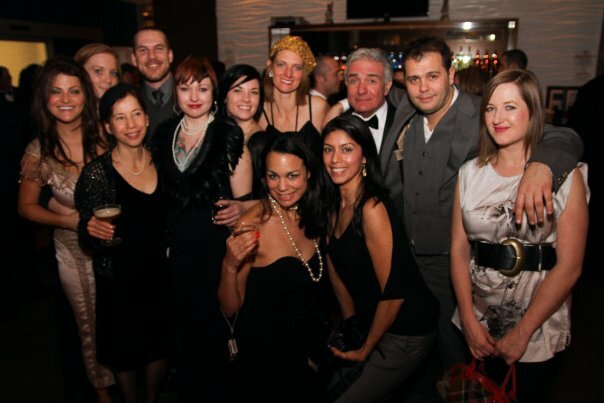 Last year, NYC crashed the DC Repeal Day Ball and had a hell of a good time! NYC crashed the DC Repeal Day Ball in style. From left, Crystal de Canton, Lindsey Johnson, Jill DeGroff, Jason Littrell, Lisa Hare, Eryn Reece, Jen Craig, Dale DeGroff, Simon Ford, Sue Leckie, and myself and Elba Giron are front and center. Photo by Leo Borovskiy of Lush Life Productions. I scrambled to find the right dress for the swank black-tie affair, hopped into the LushLifeMobile with Lindsey Johnson, Leo Borovskiy, and Jason Littrell, and away we were, braving the first blizzard of the season to get to our nation’s capital in time so that we could document it for the Museum of the American Cocktail. Being part of the press crew meant that we got to attend the event from the pre-opening stage, watching as the PS7’s crew impressively pulled together all of the necessary details for the gala, all the way to the after-party at brand new bar The Passenger. Let’s just say I got a little *dizzy* towards the end, although it was nothing too serious or worth calling my parents about. PS7’s bar manager, Gina Chersevani, chef/owner Peter Smith, along with the D.C. Craft Bartender’s Guild, showed all of us New Yorkers who made the trip that the District truly knows how to let loose 1933-style. From the magnificent punches, egg nogs, and classic cocktails served by all-star bartenders, to the red-and-black sequined ladies in pearls and feathers and the gents in suits, bowties, and a few sporting real (and some costume) mustaches, to the swingin’ jazz band, Red Hot Rhythm Chiefs, D.C.’s 76th anniversary of the end of Prohibition was a knockout soiree. The “toastmaster” of the ball, mixologist and blogger Jeffrey Morgenthaler, bar manager at Clyde Common in Portland, Ore., has made it his ongoing mission to have Repeal Day recognized as a national holiday for years now, so he was the choice host. He kept us all entertained with drinking quotes from renowned cocktailians who couldn’t make it, such as Dave Wondrich and Gaz Regan, as well as historical quotes and more tawdry quips from the crowd. Derek Brown, Dan Searing, and Owen Thompson of the D.C. Craft Bartender’s Guild dressed up as the Founding Fathers, which added some revolutionary spirit to the occasion (as in, “Spirit of ’76”). King Cocktail, Dale DeGroff, served the “Cocktel Jerez” (Jameson Irish Whiskey, Lustau PX Sherry, Lustau Dry Oloroso Sherry, Angostura Bitters, flamed orange peel) from the heart of the kitchen, which I found especially charming. His queen, Jill DeGroff, signed copies of her whimsical, soulfully-illustrated tome of bartender and musician caricatures and colorful stories, “The Lush Life: Portraits from the Bar,” which was just released in time for the gift-giving season. Ed Hamilton, founder of Ministry of Rum, mixed ti’ punches made with 100-proof rum straight from Martinique, sugarcane syrup (which you must try if you haven’t yet, and can purchase here), and a small squeeze of lime, mixed with a swizzle stick. The Tippling Bros’ Tad Carducci made a cheerfully-garnished “Gussied-Up Bread Line” (Averna Amaro, G’Vine Floraison Gin, fresh lemon, ginger beer, cranberries). Todd Thrasher (how cool is that name), mixologist at PX in Alexandria, Va., crafted a “Veritas” (Benedictine, Laird’s Applejack, homemade apple bitters, walnut water, fermented apple, cider air) which I had two of and was as amazing-tasting as it sounds. Adam Bernbach of D.C.’s Proof delivered a unique and impressive hot drink, the “Pisco in Winter” (butter-infused Macchu Pisco, citrus-spice syrup, and hot water, garnished with an Angostura-cinnamon marhsmallow, yum). Rachel Sergi of Againn meticulously strained the “Thank U-Tah,” (Tres Generaciones Anejo Tequila, Luxardo Maraschino, Leopold Bros. Three Pins Alpine Herbal Liqueur, fresh lemon, lime, orange, and grapefruit, egg, cinnamon tincture, and Fee Bros. Aztec Chocolate Bitters–whew) into a frothy flip. Philadelphia’s Christian Gaal, bartender at Apothecary and Noble American Cookery, shook up some drinks as well, and there were other punches and nogs and delightful-looking things that I wanted to try, but as you can imagine, water eventually became a necessity. By the time we sauced revelers arrived at The Passenger, which mixologists and brothers Derek and Tom Brown opened late last month, it was bustling with an already-packed crowd and the scene was in full swing. I had a punch that included dangerously good ingredients I can no longer remember, champagne spiked with rum, and a most refreshing dark beer, the Butternuts Moo Thunder Stout, which had notes of espresso and malty goodness. Oh, and the company was great–met Marshall Fawley of Scofflaw’s Den and made lots of new D.C. friends. Let’s just say it’s a good thing that D.C. bars close at 2 a.m. because I’m not sure some of us (myself included) needed to continue riding the express train to Overindulgence. I must apologize for not writing down the food menu that was offered, but every hors d’oeuvre and appetizer I tried melted in my mouth, and I hope to check out PS7’s dinner menu next time I’m in D.C. After doing a little post-event research, I discovered that PS7’s is across from the historic first meeting place of the Anti-Saloon League, which launched the crusade for Prohibition. For more photos, check out The Washingtonian, keep an eye out for We Shoot Cocktails photos coming soon here, and if you’re friends with us on Facebook: there will soon be a few extras in my album, be sure to scope the lovely Lush Life Production’s album (and video here), and for shots of more NYC-D.C. love and Sunday’s bartender brunch, check out Jason’s snap-happy album–he stuck around D.C. longer than the rest of us. Most of all thanks to Lush Life, Dale and Jill DeGroff, and all of the amazing D.C. bottlerockers. Repeal Day is the bartender’s holiday, and I was honored to celebrate it with some of the best in the country. Hope to see you again next year!